Distinguish your home from others on your street with the Whitehall Black Deluxe Mailbox. This lasting receptacle is made from die cast, rust-free aluminum and powder coated with a weather resistant, lovely black finish. The mailbox is approximately 20% larger than standard boxes, and is thus perfect for several days of mail or small packages. Its durable hinge hardware remains protected from the elements, and the magnetic door closure will last a lifetime. Personalize the item with custom plaques and toppers (sold separately) for a more dramatic look. 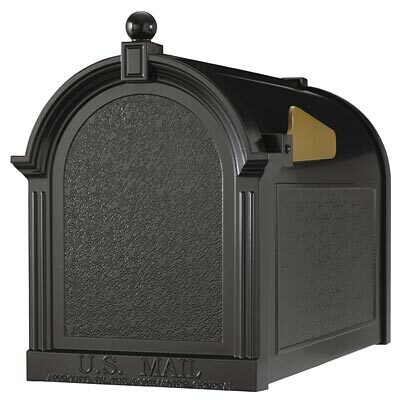 Add curb appeal to your home with this Black Deluxe Mailbox.